Ki-Jana Hoever proved one of few positives for Liverpool to take away from Monday night’s FA Cup defeat to Wolves at Molineux. 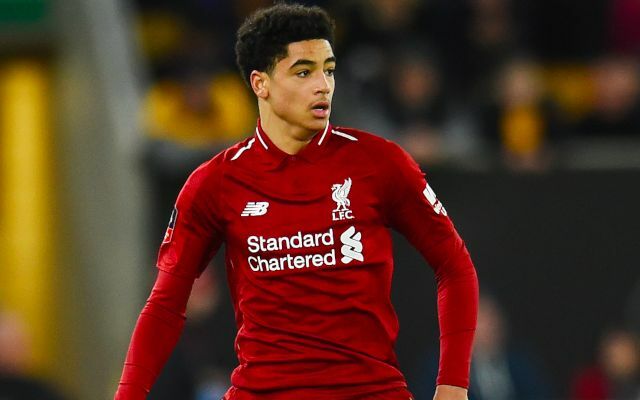 The 16-year-old became the third-youngest player ever to debut for the club when he was introduced to replace the injured Dejan Lovren after just six minutes. It continued an extraordinary start to life on Merseyside since his arrival in the summer, with the Dutchman having already earned a promotion from the club’s U18s to the U23s as well as a spot in first team training. Hoever was thrown into a make-shift back four, partnering Fabinho at centre-back between 18-year-old Rafael Camacho and the out-of-favour Alberto Moreno. In what turned out to be a dreadfully disjointed performance from Jurgen Klopp’s men, Hoever managed to display glimpses of his composure on the ball and desire to play forward from the back. Ki-Jana Hoever. Remember this name soon. 16 year old was the best player for us tonight. Showed far more composure than most of those expected. Liverpool knocked out of the FA Cup. Disappointing all round. 16-year-old Ki-Jana Hoever absolutely brilliant. Senior pro Daniel Sturridge, on the other hand, very very poor. Impressed by Ki-Jana Hoever. Looked nervous early, but it wouldn't easy coming into that six minutes into the game. Really settled nicely. Ki-Jana Hoever – very impressed, thrown in cold, playing out of position. He’ll be a regular.